The PNG mens and womens Cricket Teams- Barramundis and Lewas have something to be thankful for today after their long time sponsor SP Lager Brand announced the renewal of its sponsorship. SP Lager Brands Manager Josh Wheeler today presented to Cricket PNG a cheque of K150, 000 to support the development of their high performance program. Mr Wheeler said commended Cricket PNG for their current successes attributing them to reflection of strategic planning, good governance and management of the sport in a transparent and unified manner. 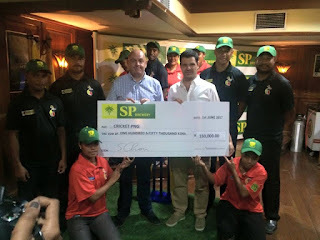 Chief Executive Officer for Cricket PNG Greg Campbell upon expressing his gratitude for the continued support of SP Lager Brand said Hebou Barramundis are ranked 15th in the world while the females team Lewas are ranked 13th and working hard to improve. Mr Campbell added that the Barramundis will start their own first class competition next week which will run for 12 weeks which is mens and womens then the Hebou Barramundis go off to play in Brisbane for upcoming Australia Cricket Competition.